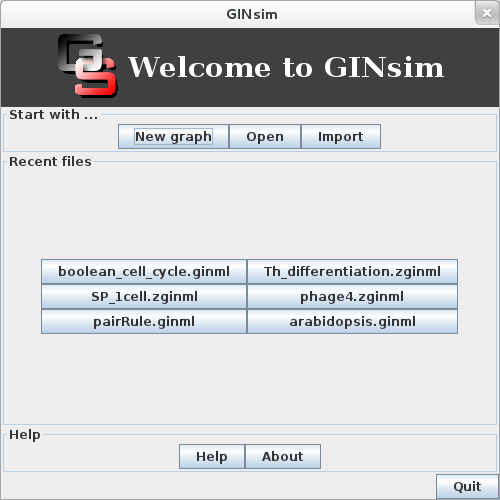 Upon launch, GINsim will present the Welcome dialog box below. The New model action will create a new Regulatory Graph, while the Open and Import buttons allow to select an existing file in a supported format. The Recent files section allows the quick selection of a previously opened file. For all these actions, the selected graph will be opened in a Main Window. Closing this dialog or activating the quit button will stop GINsim. This dialog is also shown after closing the last window (Ctrl/Cmd-W). Use the Quit (Ctrl/Cmd-Q) action to skip it. When running GINsim on the command line, it is possible to provide a file to open or to ask for a new model. In this case, the welcome dialog will not be shown. See the run options.